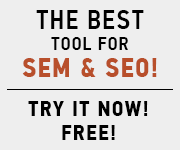 SEM is the acronym for Search Engine Marketing. With the demise of print related marketing (IE the Yellow Pages), what is a business supposed to do to market their business these days? The US Census report on Internet use in the United States declared that approximately 75% of all USA households have the Internet and if not, they have Internet access via their phones. So the reality is, your marketing dollars and/or your own time should be spent marketing your business on the WWW. Search Engine Marketing is NOT Search Engine Optimization. Search Engine Marketing is a compliment to optimized website content for Google, Bing and Yahoo. SEO or Optimization is the art of writing thoughtful, pertinent content that the Internet audience will find useful and that Google, Bing and Yahoo will place in good standing in the rankings of search terms that are relevant to your content. Optimization is absolutely necessary to get the most out of your website, however you’re not done there. Search Engine Marketing is like yummy teriyaki sauce on your steak. The steak is delicious and will satisfy your appetite, but the teriyaki sauce enhances it and accentuates and adds flavor. 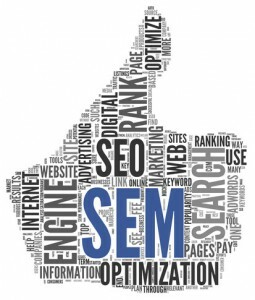 SEM (search engine marketing) is a way to verify your business is the real deal, adding to your business’ credibility…flavoring the already rich content you’ve developed. Taking time to get your site listed in the big FOUR* data aggregators that search engines like Google take into account for local listings is a great start. You can do it yourself by visiting the four sites and claiming a listing or creating one and filling out the site description, photos and business details. Apart from theses data listings that send info to many local directories, you should also concentrate on search engine marketing through other avenues. Local listing pages on Google, Yahoo and Bing are ESSENTIAL for your local business. Social media business pages can be created through sites such as Facebook, Pinterest, Twitter and LinkedIn. Business review sites such as YELP, Merchant Circle and Manta can also be a useful tool to let your local community know you exist. Paid directory listings from industry relevant websites. Premium advertising on Facebook and Google AdWords. Using these avenues of Search Engine Marketing combined with Search Engine Optimization, I have had many clients rank several times on the the 1st page of Google this way. Once with their website, second through a Yelp listing and a third time for a Facebook page – LOVE THOSE HAT TRICKS! and applying search engine marketing strategies; our goal is to help you succeed!